Natural swimming pools are a kind of pool-pond hybrid that use a dedicated zone of aquatic plants to maintain the water and they provide distinctive, organic beauty to backyards and pleasant, chemical-free swimming environments for families. Unfortunately, natural pools come with prerequisites and limitations that keep them from being a realistic option for many homeowners, as outlined in part 1 of this blog topic. Factors such as construction costs, needed yard space, design challenges, and style and functionality preferences make these pools a boutique project. Couple these factors with the scarcity of pool builders who are skilled in this particular specialty installation, and it is understandable why a natural pool is currently out of reach for most Americans dreaming of one. With its verdant landscaping, deep blue interior finish, natural stones along much of the perimeter, and beach entry, this gunite pool is an example of how some of the visual appeal of a genuine natural pool can be realized. Best of all, the pool is virtually chlorine-free. There is good news though. There is a great alternative to natural pools that can work for most homeowners: With a properly designed and equipped conventional custom pool, most anyone can enjoy some of the key advantages of its natural counterpart (along with some advantages it cannot provide, like the easy inclusion of a spa and crystal-clear water all year-round). Using specific choices of style, materials, and technology, a concrete (gunite or shotcrete) pools can achieve both a natural aesthetic and a healthy, swim-ready environment without the undesirable chemical load. On the design front, it is simple for most any custom pool builder to achieve a natural, organic look for a concrete pool. Typically, they start with a free-form shape pool and use plenty of landscaping that unifies both into a lush, aquatic poolscape. Along with a flowing shape, a number of pool-design approaches help fashion a natural appearance. 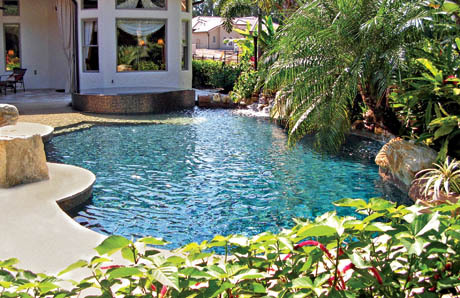 Depending on your preferences and your backyard, you can have a tropical, lagoon-type poolscape or one that is rustic and woodsy or that resembles a country pond. A poolscape inspired by Mother Nature can include features such as faux or real rock waterfalls, flagstone coping (the “frame” around the pool exterior), strategically placed accent boulders along the pool perimeter, pockets of plants in a rock waterfall, and organic-shaped landscape boxes and niches integrated into the pool structure. The deck might be composed of natural stone or even a grass lawn that blends in with the surrounding greenery. To achieve pool water that’s similar to what you see in a natural lake, pond, or lagoon, you can opt for an interior finish in black, grey or dark blue quartz or pebble. Another technique is to forgo traditional pool steps for a sloping beach entry that mimics the lake or ocean shore. When it comes to pool-water purification, a natural pool relies heavily on an ecosystem of plants, gravel, and microscopic organisms—vs. chemicals. However, a standard concrete pool can also come very close to providing healthy, virtually chlorine-free water as well. This feature just arrives at the destination using another path: The key lies in equipping the conventional pool with an ozone generator—proven technology used by thousands of pools across America and Europe. Ozone generators produce ozone, an oxygen molecule with an extra atom of oxygen. Sometimes called “activated oxygen,” ozone serves as one the strongest microbe killers on earth, yet it puts zero chemicals in the water. In swimming pools, ozone does the job historically performed by chlorine, destroying unwanted, disease-causing organisms. Ozone instantly kills bacteria, fungi, bacteria and virus, and it works so effectively and safely that hundreds of cities use it to help purify drinking water. The state of California and the International Bottled Water Association actually require drinking water to be treated with ozone. Along with complementary sanitizing equipment like mineral cartridges and ultraviolet systems, the right ozone generator ensures a pristine aquatic playground with only a tiny amount of chlorine. Without the typical chemical levels in the water, swimmers don’t have to worry about red eyes, dry skin, bleached swimsuits and hair, and awful fumes. They also appreciate how the ozone-treated pool water feels silky soft on their skin. 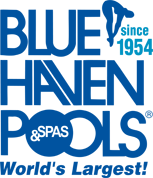 For more information on a custom pool that captures many of the key benefits of a specialty natural pool, speak to your pool builder. Be sure to ask about natural-style pools they have built in the past, as well as the kind of alternative purification systems they can offer you on your new backyard resort.